FRONTLINE Plus for Dogs has been trusted by veterinarians for flea and tick control for dogs for nearly 20 years. Made with 2 tough killing ingredients, fipronil and (S)-methoprene – one to kill adult fleas and ticks and the second to kill flea eggs and larvae – this fast-acting, long-lasting protection provides flea and tick control for dogs and puppies 8 weeks and older, 5-22 lbs. Its long-lasting formula is stored in the oil glands of the pet’s skin to give non-stop flea and tick protection for a full 30 days. Directions for Use Step 1. To REMOVE Applicator: 1. Use scissors to separate one blister; 2. Use scissors to cut along dotted line; 3. Peel down foil to remove the applicator. Step 2. OPEN Applicator. Hold upright with foil side toward you and snap applicator tip. Step 3. APPLY FRONTLINE Plus. Part the dog’s hair between the shoulder blades. Place the applicator tip just above the skin and squeeze. Apply entire contents of the applicator in a single spot directly onto the dog’s skin. Do not apply on top of the hair coat. Avoid contact with treated area until dry. Do not allow your dog to ingest the product. Do not apply to dogs weighing less than 5 lbs. or younger than 8 weeks of age. Do not use more than one application per dog per month. Frequency Use monthly to control fleas and ticks. Do not reapply FRONTLINE Plus for 30 days. 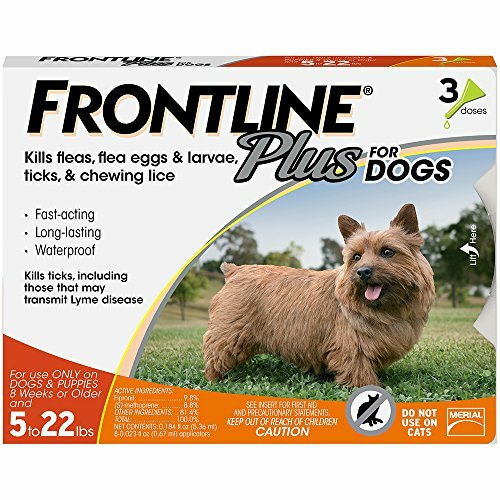 WATERPROOF FLEA AND TICK TREATMENT FOR DOGS: Frontline Plus for Dogs provides waterproof, fast-acting, long-lasting flea and tick treatment and control for your dog. This product is approved for use on dogs 5-22 lbs. LASTING FLEA AND TICK PROTECTION: Frontline's long-lasting formula is stored in the oil glands of the pet's skin to give non-stop flea and tick protection for a full 30 days. Frontline flea and tick treatment for dogs works non-stop for a full 30 days. A 3-dose supply lasts for 3 months. If you have any questions about this product by Frontline, contact us by completing and submitting the form below. If you are looking for a specif part number, please include it with your message.